Most people know it as the Main Street of America or the Mother Road, but residents of Mohave County, AZ, know historic Route 66 as the road that floods. Among the numerous at-grade wash crossings along the 90-year-old road is the Sacramento Wash, which encompasses a large watershed near the town of Topock and is particularly notorious for running over the highway. “It is a linkage that when obstructed by severe weather events, like the monsoon-type storms we get in the summer, caused road closures of many hours and sometimes days,” said Steven Latoski, Mohave County public works director. The rural two-lane road flooded 33 days during a 2-year period, causing a 24-mile detour each time and costing motorists an estimated $33,000 a day. To address the problem, Mohave County partnered with the Arizona Department of Transportation (ADOT) to install a bridge over the Sacramento Wash, the State’s first prefabricated bridge, to raise the road’s profile by 10 feet. Design work began in February 2016 and construction started with bridge placement in March 2017. The 114-foot bridge was fabricated in Phoenix and transported in sections to the site nearly 4 hours away. Engineers planned for a 4-day road closure, but crews completed the project faster in about 3.5 days, or 87 hours. A typical ABC bridge replacement project often can be done faster, but because this was a new bridge, the contractor had to construct the approaches. “According to the contractor, the actual bridge construction time was about 30 hours,” said Latoski. “It was the road construction that was actually the bulk of the work—80 hours.” Conventional bridge construction would have required an 11-week closure. The contractor earned incentive pay for completing the project within the allotted 96-hour timeframe. Total cost of the project was $2.9 million. The project received $1 million from the Federal Highway Administration’s Accelerated Innovation Deployment Demonstration program and Mohave County funded the rest. 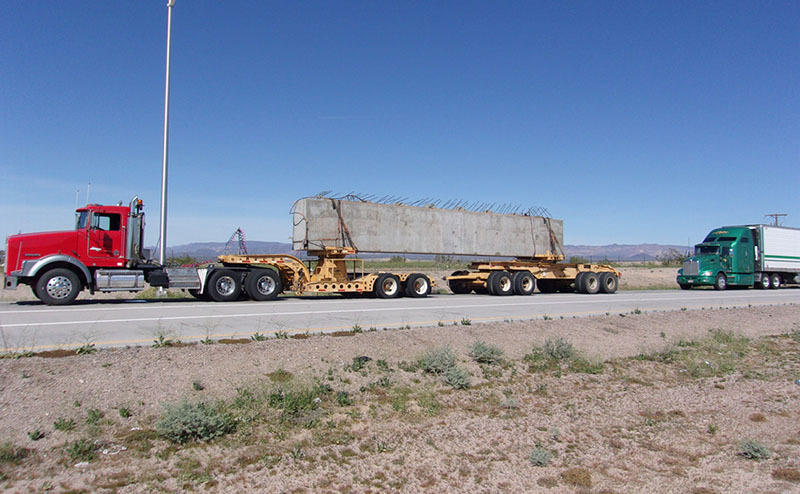 Mohave County engineers estimate using ABC with prefabricated bridge elements saved $2.6 million in expense to motorists had there been an extended detour period under conventional bridge construction methods. FHWA, ADOT, and Mohave County partnered on a demonstration showcase to coincide with construction. More than 80 participants came from State and county agencies—including the Illinois State Toll Highway Authority and the California, Nevada, and Utah Departments of Transportation—and private industry to view ABC in action. “ADOT is working to develop standard ABC drawings and specs to help expedite projects like this in the future,” said Haque. ADOT is also considering another ABC project with prefabricated elements that is now in design. Three reports document Accelerated Innovation Deployment (AID) Demonstration projects that received funds to use accelerated bridge construction technologies to save time and money. The White Swan Bridge Replacement report discusses lessons learned on an Ohkay Owingeh Tribe project in New Mexico that used a geosynthetic reinforced soil-integrated bridge system (GRS-IBS) and precast superstructure. 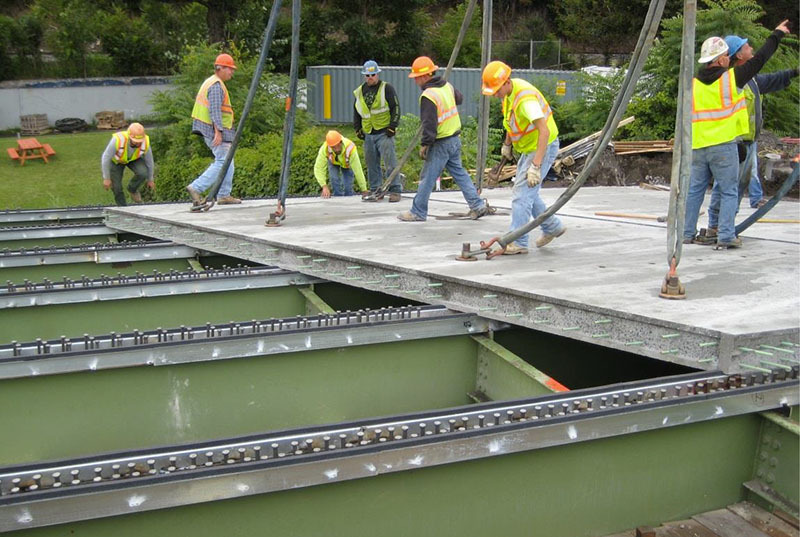 Gifford Pinchot National Forest Layout Creek Bridge Project describes a U.S. Forest Service project in Washington that deployed GRS-IBS and a superstructure designed with prefabricated prestressed concrete beams. In Slide-In Bridge Construction Project Over 3 Mile Road, the Michigan Department of Transportation explains the selection of slide-in bridge construction as a cost-effective way to reduce traffic disruption and increase safety on the project. See more AID Demonstration project reports in which agencies and tribes describe their experiences with innovation. View a video of accelerated construction of a bridge over the Sacramento Wash in Arizona. Integrating environmental reviews and permitting can lead to more efficient and effective delivery of transportation projects. Many transportation projects require multiple Federal permits and reviews to ensure agencies build them safely and responsibly and minimize impacts on communities and the environment. But securing those permits can add time and costs to the project delivery process. Integrating National Environmental Policy Act (NEPA) and permitting processes—a strategy the Federal Highway Administration is encouraging in Every Day Counts round four (EDC-4)—enables concurrent, synchronized environmental and permitting reviews. Synchronization provides for more effective and efficient reviews, leading to projects with reduced environmental impacts and time and money savings. “Integrating NEPA and permitting is all about accelerating the permitting process,” said Gloria Shepherd, FHWA associate administrator for Planning, Environment, and Realty. Fourteen States and Federal Lands Highway plan to demonstrate and assess tools to integrate NEPA and permitting processes in EDC-4. Another 15 plan to make integrating NEPA and permitting processes on projects a standard practice. “Part of integrating NEPA and permitting is to reduce redundancy so we’re not doing the same thing over and over again,” said LaTonya Gilliam, Environmental Stewardship Program manager for the Delaware Department of Transportation, which has set a goal of demonstrating NEPA and permitting processes during EDC-4. Integrating NEPA and permitting builds on earlier EDC efforts to streamline project processes through programmatic agreements to handle routine environmental requirements and improving collaboration and quality environmental documentation. The EDC-4 approach features proven best practices, data management, and tools to help agencies develop new or leverage existing integration practices and facilitate interagency coordination on projects. One tool FHWA is promoting is eNEPA, an online system that supports timely, consistent coordination among agencies on permitting processes. The newest version, eNEPA 2.0, includes customizable workflows, improved document review functions, and a dashboard function. Another tool is the 2015 Red Book: Synchronizing Environmental Reviews for Transportation and Other Infrastructure Projects. 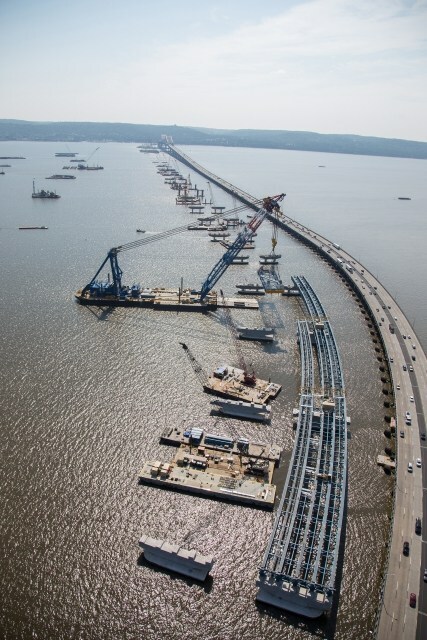 Integrating NEPA and permitting processes allowed the New York State Thruway Authority to cut years from the time needed to secure permits for the New NY Bridge project to replace the Tappan Zee Bridge. The authority chose the design-build project delivery method and accelerated permitting and reviews to speed up the replacement of this vital transportation link over the Hudson River between South Nyack and Tarrytown. Developed agreements with each cooperating resource agency. Established one point of contact for each agency and project team with the power to make decisions. Held regular meetings to discuss expectations and set priorities. Conducted a workshop for regulators on design-build contracting. As a result, the project progressed from notice of intent to record of decision in 11 months and obtained permits in 18 months, a process that typically takes years for large projects. The project demonstrates the benefits of integrating NEPA and permitting processes on big projects, but the strategies can also be applied at the program level, to small projects, or to parts of large projects. “One of the beauties of this approach is that it’s scalable,” said Ruth. Watch an EDC-4 webinar on integrating NEPA and permitting processes. Visit the Integrating NEPA and Permitting Resources Library for case studies, tools, State agreements, publications, and presentations. See the FHWA Environmental Review Toolkit for information and resources. Innovation is key to helping the Kentucky Transportation Cabinet (KYTC) achieve its goal to make transportation better for people, says Assistant State Highway Engineer Jason Siwula. 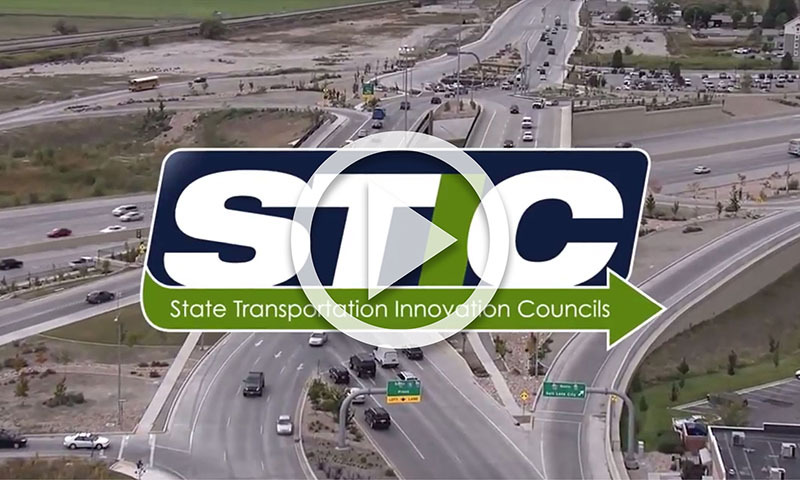 Kentucky’s STIC, one of three recipients of 2016 STIC Excellence Awards from the American Association of State Highway and Transportation Officials and Federal Highway Administration, enables public and private transportation stakeholders to partner on innovation deployment. Siwula cited the Kentucky Utilities and Rail Tracking System (KURTS), a Web-based system that allows utilities and railroads to access and contribute information on KYTC projects, enhancing transparency and collaboration. KYTC, which received STIC Incentive funds to develop the system, collaborated with railroads, utilities, FHWA, and others on the project. Now KYTC is sharing the KURTS concept with other States. “We hope this system is something that will be of use to others,” said Siwula. Butch Waidelich, FHWA acting deputy administrator, opened the STIC meeting by reinforcing FHWA’s commitment to collaborating with States to implement innovation. David Esse, Wisconsin Department of Transportation (WisDOT) innovation officer, discussed how his agency fosters a culture that encourages people to innovate. In addition to working with external stakeholders through the Wisconsin STIC to advance innovation, WisDOT formed an internal Innovation Review Committee to evaluate ideas. Committee members represent agency functions such as traffic operations, project development, and information technology. “Having this multidisciplinary approach has been beneficial for quickly vetting ideas and getting the ball rolling,” Esse said. Esse’s national STIC meeting remarks echoed his presentation at a STIC workshop at the 2016 Transportation Research Board Annual Meeting. “The idea behind the TRB workshop was to enable participants to discuss elements of successful STICs,” said Sara Lowry, program coordinator for FHWA’s Center for Accelerating Innovation (CAI). Lowry encouraged STIC members to view the workshop videos and share their own STIC success stories and ideas at innovation@dot.gov. View a video on how STICs build innovative cultures in States. For more videos on advancing innovation through STICs, see the STIC playlist. Jeffrey Zaharewicz, CAI senior advisor, introduced an Education Connection initiative in which Every Day Counts innovation teams are developing tools high schools, trade schools, colleges, and universities can use to educate future transportation practitioners through approaches such as YouTube videos, TED-style talks, class lectures, and workshops. Deployment teams will travel throughout the country in 2017 and 2018 to offer training, hold peer exchanges, and provide tools to help the transportation community implement the innovations in Every Day Counts round four, said Tony Furst, FHWA chief innovation officer. “Please look for opportunities to attend these events and partner with other States in the STIC network,” he said. A diverse team of transportation and law enforcement professionals took a focused approach to solving safety issues along a busy Missouri highway corridor. Multiple wrong-way crashes, including a double fatality, had occurred on the 100-mile stretch of State Route 54 between the cities of Camdenton and Mexico, prompting the Missouri Department of Transportation (MoDOT) to conduct a road safety audit (RSA). RSAs are formal safety performance examinations of existing or future roads or intersections by an independent, multidisciplinary team. RSAs qualitatively estimate and report on potential road safety issues and identify opportunities for improvements in safety for all road users. The audit team isolated and examined three crash types occurring frequently on the roadway—wrong-way, curve, and cross-median. The team started by analyzing crash data for the period between January 2011 and July 2016. Once crash locations were identified, the team loaded into a van and drove the corridor to visually inspect them and other locations with similar characteristics. The focus on examining specific crash types and roadway features made the project more manageable. The RSA team included MoDOT engineering, management, and communication practitioners, as well as staff from the Federal Highway Administration and Missouri State Highway Patrol. The variety of perspectives made the group—and the audit—more effective. Based on the audit’s findings, the team recommended cost-effective countermeasures for the trouble spots, including chevron signs on curves, median guard cables to mitigate cross-median crashes, and high-friction surface treatments (HFST). Promoted in Every Day Counts round two, HFSTs are polymer pavement treatments that can dramatically reduce crashes associated with friction demand issues, such as around curves. MoDOT chose to apply HFST to seven curves on Route 54 because it had worked well in the past. In the end, Silvester noted, the RSA helped MoDOT exceed existing safety standards. 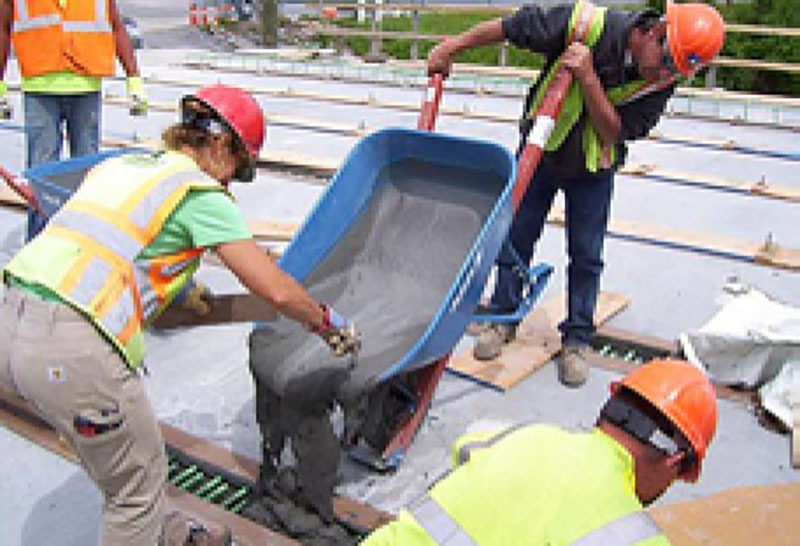 The prospect of improving the strength, simplicity, and durability of prefabricated bridge component connections is driving interest in ultra-high performance concrete (UHPC), a steel fiber-reinforced material that delivers performance that far exceeds conventional concrete. An Every Day Counts round four (EDC-4) innovation carried over from EDC-3, UHPC has been used in the construction of more than 150 bridges in North America, in most cases to make strong field-cast connections between prefabricated bridge elements (PBEs). UHPC allows for small, simple-to-construct connections that require less concrete. The material’s mechanical properties enable the design of connection details in ways that promote ease and speed of construction with PBEs. “UHPC is the next generation of concrete. It’s a new tool in the toolbox that lets us build bridges differently so they’ll give us the performance we demand,” said Ben Graybeal, FHWA Bridge Engineering Research Team leader. In EDC-4, transportation departments in 22 States and the U.S. Virgin Islands as well as Federal Lands Highway plan to demonstrate and assess the use of UHPC connections in bridge-building processes. In another 10 States and Washington, DC, using UHPC connections on bridge projects that use PBEs is expected to be a standard practice by the time EDC-4 ends in December 2018. 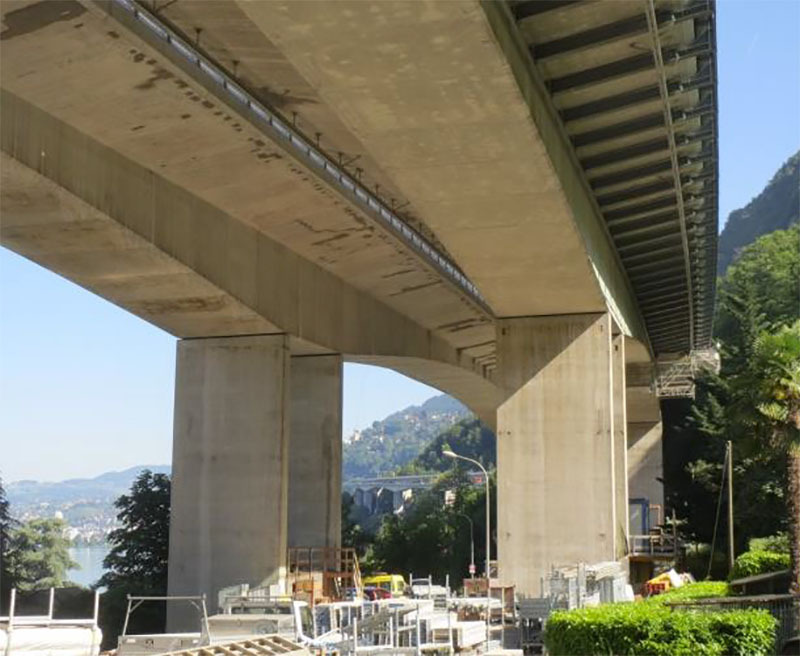 UHPC was used for bridge deck rehabilitation on the Chillon Viaduct near Lausanne, Switzerland. So far, New York has completed 45 UHPC projects, the most in the country. On a project to replace the I-87 bridges over Albany-Shaker Road in Colonie, the New York State Department of Transportation kept construction time to one season by using precast deck panels with UHPC joints. 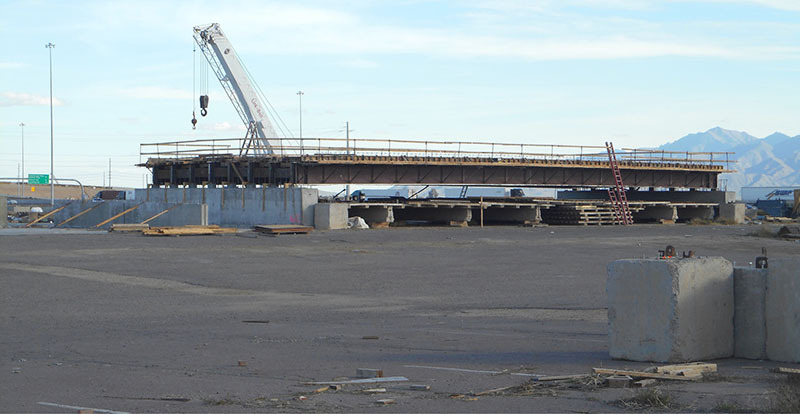 The New Jersey Department of Transportation (NJDOT) used UHPC to connect precast deck panels on the Pulaski Skyway, the Nation’s largest accelerated bridge construction project. 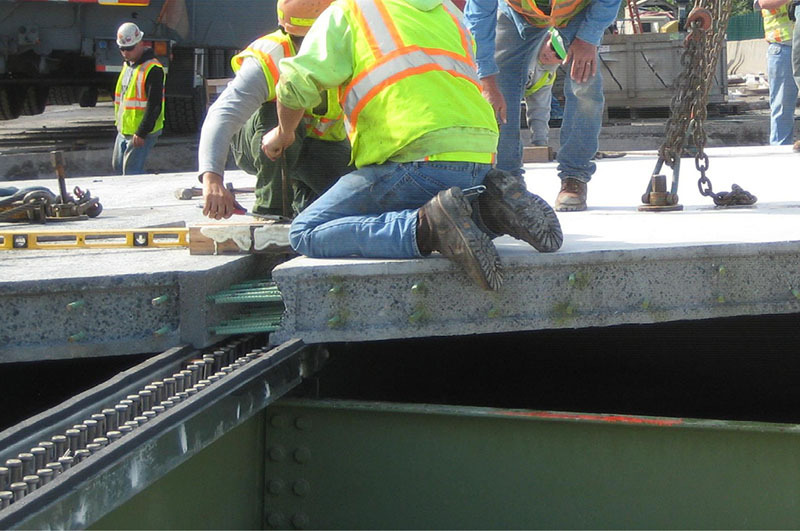 “With the implementation of UHPC, we were able to keep construction joints to a minimum in width and length, saving time and money and speeding up the project,” said David Hawes, NJDOT resident engineer for the northeastern New Jersey project. In Iowa, UHPC was used on four projects to connect PBEs and on another four to prefabricate the components and then connect them. A project in Buchanan County was the first in the country to apply a UHPC overlay on a deteriorated bridge deck. UHPC connections make using prefabricated bridge components simpler and more effective for accelerated bridge construction. In Pennsylvania, an early UHPC adopter, the technology has been used on 10 bridge projects and incorporated into Pennsylvania Department of Transportation (PennDOT) publications and standards. “We use UHPC in areas with high volumes of traffic where we need to close a bridge, make an improvement to it, and then get it open to traffic quickly,” said Kristin Lager, PennDOT assistant chief bridge engineer. Several transportation departments have UHPC projects in the works or at the planning stage. In South Carolina, work is underway on a four-span bridge in Kershaw County. One span uses precast modified North Extreme Tee Deck (NEXT-D) beams, developed by the South Carolina Department of Transportation (SCDOT) and Clemson University, with UHPC in the shear keyways between the sections. Two spans use hollow core precast slabs connected with UHPC. The fourth span uses precast, prestressed solid slab sections joined with UHPC. SCDOT is monitoring the durability of the different types of construction to glean information to apply on future projects. 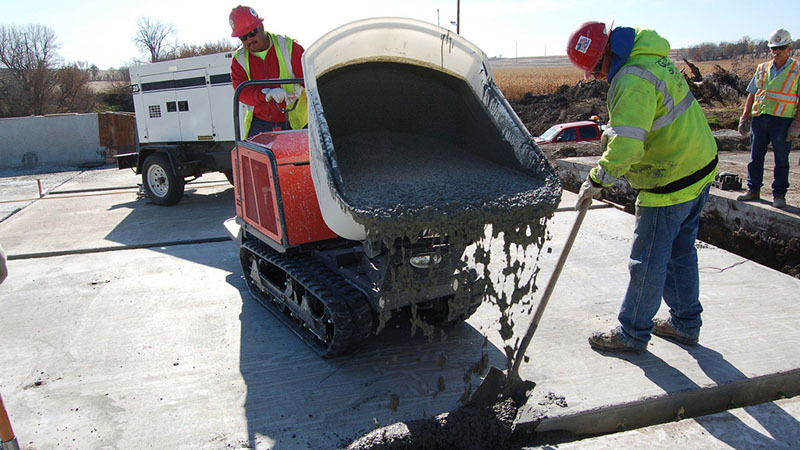 UHPC allows for small, simple-to-construct connections that use less concrete than conventional connections. The Idaho Transportation Department plans three bridge replacement projects in 2017 that incorporate UHPC. On two projects, UHPC will be used to make connections between deck bulb-tee girders, which will facilitate the construction of PBEs. The third project will use UHPC to connect precast elements. The California Department of Transportation identified two multispan structures for pilot projects using UHPC to connect precast columns to precast bent caps. Scheduled for 2017 construction, the projects will help the agency develop design details and guidance to quickly and uniformly implement accelerated bridge construction while mitigating project risk. Watch a video on UHPC and its use on bridge projects in Minnesota and New York. Register for upcoming webinars and watch recordings of past sessions in FHWA’s series on UHPC connections for PBEs. View an interactive map of transportation projects built in the United States and Canada using UHPC technology. Contact Ben Graybeal of the FHWA Turner-Fairbank Highway Research Center or Mark Leonard of the FHWA Resource Center for information and technical assistance. The Florida Department of Transportation (FDOT) built the Nation’s largest diverging diamond interchange (DDI) at I-75 and University Parkway in Sarasota. Benefits of the DDI project include improved traffic operations and safety for motorists, bicyclists, and pedestrians. The project also added new bridges, noise barrier walls, lighting, traffic signals, sidewalks, bike lanes, and pedestrian walkways. 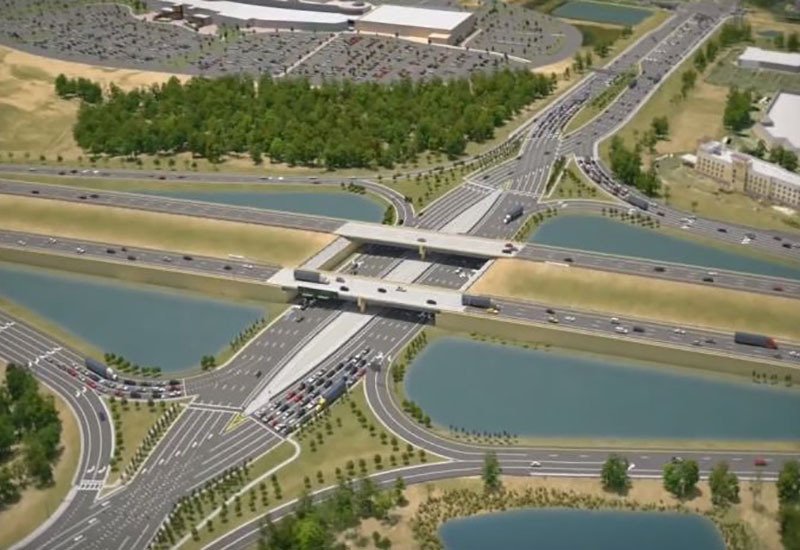 An FDOT video provides an overview of the DDI. Construction is underway on an Indiana Department of Transportation project to replace the I-70 bridges over State Route 121 near Richmond. The project, being built with accelerated bridge construction technologies, is the State’s second to use slide-in bridge construction, in which a bridge is built on temporary supports and slid into place. The project received Accelerated Innovation Deployment Demonstration program funds. 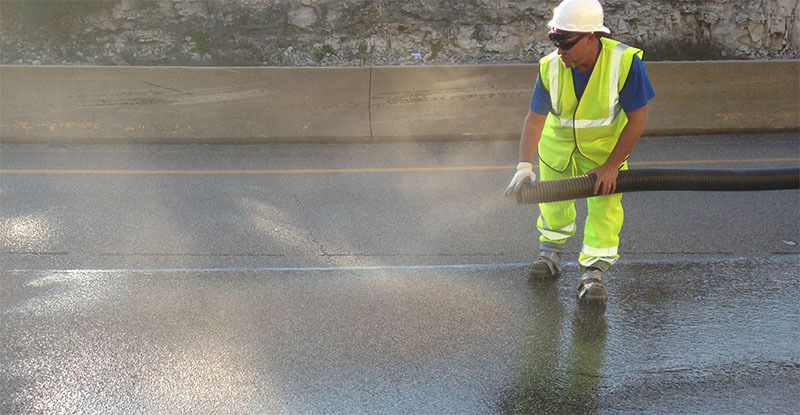 The Michigan Department of Transportation (MDOT) installed high-friction surface treatments (HFST) on mainline interstate lanes for the first time. MDOT applied HFST on a 1-mile stretch of I-94 in the southwest part of the State and on a quarter-mile section of I-75 north of Detroit. The agency started using HFST—pavement overlay systems with exceptional skid resistance—on Michigan roads and ramps in 2007. The North Dakota Department of Transportation (NDDOT) is testing a fiber-optic traffic monitoring system on I-29 in Fargo. The equipment can detect real-time traffic speeds along the length of the fiber-optic cable buried next to the road and volume data at locations where the cable crosses travel lanes. This is the first North American test of the traffic monitoring capabilities of the system and the first global test of traffic counting. The system was identified through NDDOT’s Transportation Innovation Program, which received funding from the State Transportation Innovation Council Incentive program. Seattle, WA, has a new high-tech tool to ease congestion along one of the city’s worst traffic bottlenecks—the Mercer Street corridor. The city introduced an adaptive signal control technology (ASCT) system that is expected to shave minutes off travel times between 3rd Avenue West and I-5. The ASCT system, installed at 32 signalized intersections, works in real time to sense changing traffic volumes and adjust the timing of green lights.